You are at:Home»Lex Bulletin»Conference»GNLU & Hague Academy of International Law’s 40th Session of 2103 External Program. Gujarat National Law University (GNLU), Gandhinagar, (www.gnlu.ac.in), in collaboration with the Hague Academy of International Law, the Netherlands, is organizing the 40th session of 2013 External Program at the GNLU from 1 to 8 November 2013. The external program, which was established in the 1969, is organized first time in South Asia. GNLU has great privilege to host the same at its premises. 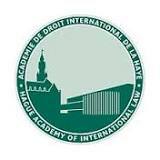 The Hague Academy of International Law (www.hagueacademy.nl), one of the most prestigious international law academies of the world, since its creation in 1923, is being hosted at the Peace Palace, alongside the highest judicial institutions such as the International Court of Justice (ICJ) and the Permanent Court of Arbitration (PCA). It is a centre for research and teaching in public and private international law, with the aim of further scientific and advanced studies of the legal aspects of international relations. The Academy Curatorium is headed by H. E. Boutros Boutros-Ghali, former Secretary-General of the United Nations. The Vice-President and Members of the Academy Curatorium are few of the most prominent personalities in public and private international law in the world. The 2013 Edition will focus on the theme of Stability and Change in the Law of the Sea and Challenges for the 21st Century. Participants: India (20), Afghanistan, Bangladesh, Bhutan, Cambodia, Indonesia, Laos, Malaysia, Maldives, Myanmar, Nepal, Pakistan, Singapore, Sri Lanka, Thailand, Vietnam (about 20). Fee: There is no fee for participation in external program of Academy. Last Date: July 31st, 2013, 23:59 hrs. • It is not allowed to participate more than once in the external programme of academy. • Application received within due date will only be considered for final selection. • GNLU selection committee will select the candidates for external program & decision of GNLU selection committee will be final and binding. • Selected candidates will be notified on 20 August, 2013. • GNLU will provide free of cost lodging and boarding in GNLU to all selected candidates. • Send soft copy of application by email to with application form [email protected] and hard copy on given address along with enclosures on or before last date. • Applications received after stipulated date will not be considered for selection. • Applications received electronically and physically along with aforementioned enclosure will only be considered for selection. Next Article Azim Premji Foundation Fellowship Program 2013-15, Stipend Rs. 26,000 P.M.